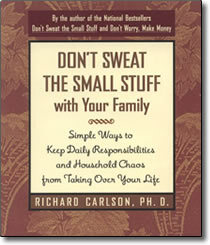 In his number one national bestseller, Don’t Sweat The Small Stuff, Richard Carlson, Ph.D., showed listeners how not to let the small things in life drive them crazy. In Don’t Worry, Make Money, also a number one bestseller, he discussed ways to have a more abundant and joyful life, all while refusing to let financial concerns overcome us. Now, in Don’t Sweat The Small Stuff with Your Family, we hear how not to let small annoyances in our home lives get us down. From defusing kids who are whining or fighting, to working out issues with a spouse, to reducing the hassles over household chores, Richard Carlson tells us ways to make our relationships at home — the place where it counts most — more peaceful and loving.